FANUC Robotics and Robot Services for Ohio and Western Pennsylvania Provided by J.B. Industries, Ltd.
JBI is an industry leader in robotics in Ohio, and an authorized Systems Integrator for FANUC Robotics. We are dedicated to servicing customers located in Northern Ohio and Western Pennsylvania. Our overall mission is to ensure that we effectively help you to accomplish your vision. FORGING, STEEL PROCESSING, PIPE/TUBE HANDLING, and CAST METALS. We pursue applications in Material Handling, Press Tending, Machine Load/Unload, and Assembly. The combination of reliable and intelligent robots with our innovative systems design and quality manufacturing capabilities provides a package to reduce costs, improve quality, and maximize productivity. Our goal with FANUC Robotics is to create a solution that will increase our customer’s competitive position in the global market. Whether your requirements are material handling or industrial processing, JBI will analyze your application and select the proper FANUC Robotics solution based on reach and load capacity. In addition, we will design the tooling and supporting equipment complete with controls to achieve your objectives. In addition to system solutions, we provide design and manufacture for robot cell components such as End of Arm Tooling, Weld Fixtures, and Controls. 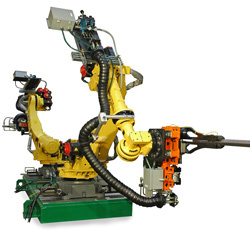 FANUC robots boast faster programming and longer cable life, which provide a direct reflection of their superior efficiency, versatility, and flexibility. Using FANUC Robotics to streamline routine processes will enable your company to confidently pursue new endeavors and initiatives, reach new levels, and achieve additional successes. Afford your business the opportunity of becoming a major competitor in your industry by implementing the use of robotics to efficiently accomplish your goals and to gain an edge on your competition. If your business is located in the greater Northeastern Ohio area, then contact us today to learn more about robotics information specific to your application. We are committed to effectively addressing your goals and to providing you with a robotics solution that will enable you to meet and exceed your expectations. Feel free to call us at 330-856-4587 or to email us at j.bancroft@jb-industries.com with any questions or concerns that you may have about robotics, or how industrial robots can impact the future of your business.